Expedition Leader Justin Hofman is spending most of the summer on superyachts and leading expeditions for us in Alaska. Read about his first weeks being back after an absence of a few years and the excitement he feels returning to this wild coastline. With over 10,000 km (6,600 miles) of coastline, Alaska is easily explored by sea and this season I’m very excited to return to my expedition roots aboard several vessels in region. Having started as a deckhand on Alaskan expedition ships and eventually exploring much of the Inside Passage as an expedition diver, Alaska holds a warm place in my heart. From calving glaciers to grazing brown bears, truer wilderness is difficult to find in our ever expanding and developing world. With easily-accessible inlets and protected channels throughout much of its coast line, the violent and raw Alaska we are presented on television is often far from the reality of our serene scenic cruising. Nestled amidst a myriad of islands and large mountain ranges is one of the best cruising grounds in the world complete with rich cultures of Northwest tribes like the Haida and Tlingit and great assemblages of wildlife. As the summer progresses into full swing, Alaska holds some of the greatest wildlife spectacles on Earth. Thousands of humpback whales descend upon this stretch of coast to feast upon herring, brown bears crowd streams to gorge themselves on salmon, and killer whales ply the waters like maritime wolves. When wildlife encounters reach a saturation point, there are unique communities scattered among the islands and fjords with friendly locals and their Alaskan tales never that far from hand. After watching wildlife or hiking in the rainforest, it’s easy to pop into a small town to stock up for a feast of fresh-caught crab or chat with folks from the local Indian clan to learn about their stories and connection to the region. The lure of coastal Alaska can be summed up in one word: wilderness. There are few places on Earth where you can so easily cruise through incredible scenery with the opportunity to see so much wildlife. Our early season adventures have already been full of excitement and it’s not even June. We recently spotted our first coastal brown bear cub of the season deep in the quiet waters of Misty Fjords National Monument. So far the early season highlight (potentially of the entire season) was an encounter with a creature which encapsulates wilderness more than any other animal. On our very first outing we got a great look an animal I have never even gotten a glimpse of, a life first for many in the group. Low down on a bluff we spotted the devil bear. The great wanderer of the forest, mountain, and tundra. A wolverine. 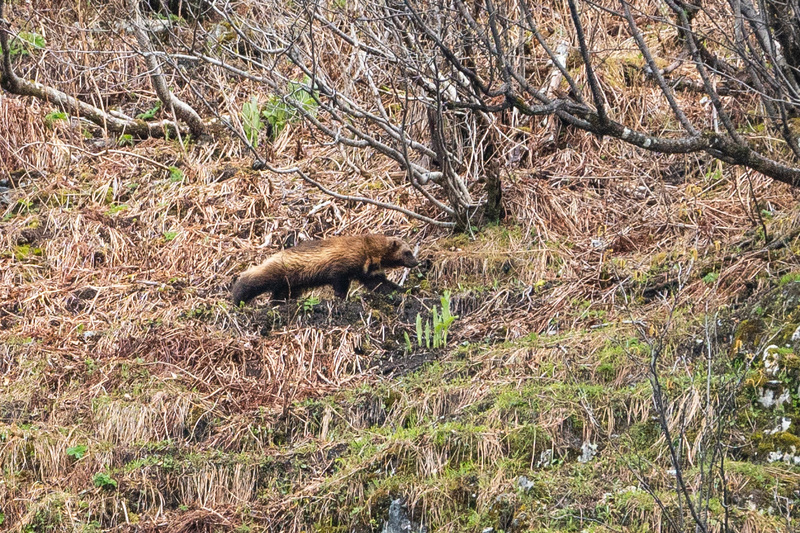 These huge weasels have massive home ranges which they roam non-stop throughout the year which means wolverines can only be found in places with gigantic tracts of unbroken wilderness, free from human development and disturbance. It was an early reminder that Alaska is an important, massive, and special place.